Having little else to attack Barack Obama for, FOX News is beating him up for rising gas prices, going so far to use blatantly misleading charts. Etcetera. Meanwhile, this was happening. The protesters regrouped and turned their attention directly to Wall Street, escalating the conflict with police. Meanwhile, John reports that actual Wall Street employees were more annoyed with the cops than the occupiers. Maybe. It’s muy fabuloso that something is happening (which reminds me: are you following Josh Harkinson? because you should), but I wonder what the endgame here is, and I don’t think it’s premature to think about that. Movements die all the time, and fear that this movement will die out is far from the only reason to hope that it comes up with something, and soon. Direct action is great, and it may be essential. But the risk with what happened yesterday is that it will begin to alienate people at some point. “Those rabble rousers? I think things need to change, but I’m not down with them.” Remember the WTO protests in Seattle? They made a statement for sure, but somehow I don’t think that’s where you want this headed. A list of accomplishments for the day that leads with how many were arrested is a sign of trouble. Here’s just one way: almost every voter pays at least $50 in some form of federal taxes. So imagine a system that gave a rebate of that first $50 in the form of a “democracy voucher.” That voucher could then be given to any candidate for Congress who agreed to one simple condition: the only money that candidate would accept to finance his or her campaign would be either “democracy vouchers” or contributions from citizens capped at $100. No PAC money. No $2,500 checks. Small contributions only. And if the voter didn’t use the voucher? The money would pass to his or her party, or, if an independent, back to this public funding system. Fifty dollars a voter is real money: more than $6 billion an election cycle. (The total raised in 2010: $1.86 billion.) It’s also my money, or your money, used to support the speech that we believe: this is not a public financing system that forces some to subsidize the speech of others. And because a campaign would have to raise its funds from the very many, it could weaken the power of the very few to demand costly kickbacks for their contributions — what the Cato Institute calls “corporate welfare,” like subsidies to ethanol manufacturers, or tariffs protecting the domestic sugar industry. Cato estimates that in 2009, the cost of such corporate welfare was $90 billion. If cutting the link to special interest funders could shrink that amount by just 10 percent, the investment would, across a two-year election cycle, pay for itself three times over. Did you catch that? What are we going to cut the first time we need that $6 billion, before the corporate welfare money starts coming back, professor? Now, I it’s not like I think this is a reason to abandon the ideas in the book. This is how academics work: you publish the idea you’ve got, and let others build on it and patch the holes in it. Edison’s light bulb was useless until other people came along and tweaked and refined it and built the electrical grid. And yet — there the problem sits, unadressed. And BTW, since you people are not listening to my podcast, you should check out yesterday’s Slate Gabfest, which is absurdly smart on #Occupy. Image above is from a CBS live stream, via a screengrab on The Atlantic Wire. Posted on November 18, 2011 by Alesh Houdek. Posted in Politics1 Comment on What’s up with #Occupy? I’d say the Herald Story got it wrong: There were at least 2,500 people at Saturday’s Occupy Miami protest. Things started at 1:30 pm at the Friendship Torch in front of Bayside. City of Miami Police were exceptionally supported, despite the (unplanned?) march. The protesters (also extremely well behaved, it should be noted) stopped at the crosswalk when the light turned red, and an officer pulled up and handed out water and cardboard for signs, and was generally enthusiastic. Along the rest of the route, officers stopped traffic to allow the marchers through. — Lessig begins to lay out his arguments for reforming Congress. Here’s Susan Page of USA Today admitting, on the radio, that she had a dream about Sarah Palin endorsing Tim Pawlenty. That is all. Update: And just like that, he pulls out of the race. Doctors can’t ask their patients about guns? EMILY: Did you hear about this? They just passed a law in Florida that says Doctors can’t ask their patients whether there is a gun in their house. JOSH: That’s weird. Why is the government telling doctors what they can and can’t say to their patients? And why are doctors asking about guns? I could see asking someone if they’ve been shot … but asking if there’s a gun in the house? What medical relevance could that possibly have? EMILY: They’re concerned about safety. Pediatricians often ask parents if they have a gun in the house, and if so, whether it is stored safely. Haven’t you heard of all the kids that accidentally kill themselves or their friends playing with a gun they found around the house? JOSH: Are those doctors also trying to get the parents to stop driving? Are they talking to them about pool safety, matches, blankets and plastic bags the kids can suffocate on, stairs, and a million other things? Because all those things are way more likely to kill a kid a kid than an accidental gunshot. Seems to me that, of all the household dangers facing a kid, a gun would be the most obvious to a parent. If they’re not a complete imbecile, they’ve already got it stored properly. And if they are an imbecile, having a doctor up in their face isn’t going to help. EMILY: Well, the American Academy of Pediatrics says, “the absence of guns from children’s homes and communities is the most reliable and effective measure to prevent firearm-related injuries.” Meanwhile, of course the legislation to muzzle doctors is written by the good ‘ol NRA. JOSH: Oh, so the pediatricians are open about trying to get guns out of the homes? It seems that we have a right to own guns in this country whether we have kids or not. If I had a gun, I sure wouldn’t want my kid’s doctor giving me crap about it every time I take my kid in. JOSH: What possible set of circumstances would warrant action with a gun that wouldn’t warrant action without one? If you’ve got a dangerous adult in the house, it seems to me they’re just as dangerous without the gun. Aren’t kids much more likely to be beaten to death by their parents than shot to death? EMILY: So you’re okay with the law dictating what doctors can and cannot say to their patients? JOSH: Well, something sure as heck dictates what doctors should and shouldn’t say to patients. Some things are useful to discuss, and some things are a waste of time. Doctors sure as heck better make the best use they can of the limited time they have with their patients, right? Traffic accidents kill 45 times as many kids as gun accidents, and four times as many as all homicides combined. So hopefully doctors are spending way more time lecturing parents about driving as safely — and as little as possible — as they spend talking about guns. EMILY: OK, suppose you have a suicidal teen talking to a doctor. You’re really saying the doctor can’t bring up guns? JOSH: Actually, it turns out that there’s an exception in the law if the doctor feels the gun issue is directly relevant to the patient’s care or safety. Suicidal teens would be a great example of that. EMILY: What about the example of a kid being bullied at school. Can a doctor ask if the kid has a gun in the house? If he’s ever brought a gun to school? If he’s though about harming himself or anyone else with a gun? This type of law will have a chilling effect on doctors — force them to try to figure out whether the question they want to ask meets the legal standard for being directly relevant or not. Do you really want doctors to have to keep these legal distinctions in the back of their mind when talking to patients? JOSH: Everything doctors do is governed by laws. Doctors make these sorts of decisions all the time — often wrongly, which is why we have so many malpractice suits in this country. But I don’t get the example — you can ask a kid if he’s thought about hurting himself or anyone else. If he has, you take action. At that point, telling the parents to make sure the gun is stored safely pretty obviously falls into the legal exception. EMILY: I don’t know. It still seems wrong for a state legislature to dictate what doctors can and can’t talk about with patients. JOSH: Look, guns are a touchy subject in our society. But it’s been legally determined that they’re permissible. Understandably anti-gun folks want to continue the fight, but should doctors really be allowed to use their position of power to promote their particular views? We have laws that prevent teachers from spreading their political views to their kids. Why not similar laws for Doctors? EMILY: Vaccines and abortion are both touchy subjects in society. Are laws that tell doctors what they can say about those things next? JOSH: Okay, that’s the slippery slope argument. People who are in support of those things will pass whatever laws they can. The existence of this law isn’t going to make much of a difference. But for the record, if anyone passes a law that tells doctors they can’t strongly encourage parents to get their kids vaccinated, I’m moving to Canada. Thanks to Steve for hashing out this debate with me, and for most of the links above. Posted on June 3, 2011 by Alesh Houdek. Posted in Law, Politics4 Comments on Doctors can’t ask their patients about guns? Revelations came recently from the Wikileaks cable dump that North Korea has been selling nuclear weapons to Iran (oh, right, and long-range missiles to deliver the nukes to, say, western Europe), which should come as a shock to exactly nobody — they’ve previously been found to be selling nuclear material to Syria. The only question is to whom is North Korea not selling nuclear materials. Why not Hamas or Al-Qaeda? 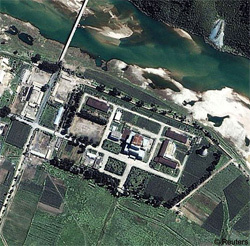 According to the ISIS, North Korea has at least 9 nuclear weapons and is not slowing down with its enrichment programs. Okay, that’s one thing. Now consider a second thing: North Korea’s increasing aggressiveness towards South Korea. They torpedoed a South Korean warship back in March, and have repeatedly attacked the nation in other ways, most recently with artillery shells aimed at residential areas on Yeonpyeong Island. So we have North Korea’s wanton nuclear proliferation, and it’s growing aggression towards South Korea and the rest of the world. What’s the proper reaction to this? I’d argue that it’s time to reconsider our present strategy of doing nothing. Here is a country that so oppresses its people that the richest among them — the ones trotted out for international show — live in slum-like conditions, in constant hunger, in fear of saying or doing the wrong thing and being thrown into one of the country’s famous concentration camps. The conditions are actually worse than in 1984: patriotic songs are blasted from loudspeakers in the streets every hour on the hour from 6 am to midnight, the media (along with literally everything else) is owned and operated by the government, and the bizarre leader is worshiped and widely believed to control the weather with his emotions(!). This country allowed 2.5 million people to starve during the 1990s famine so it could support its military (note: the average North Korean is six inches shorter than the average South Korean). It runs a secret system of gulags in which torture is commonplace, and in which 400,000 people have died in the last quarter century. And by the way, part of the mind control system in the country is to brainwash racism and contempt for everyone else in the world into its people. Now look, I’m no pro-war hawk. I opposed the Iraq invasion from the first moment it started being discussed. I think most of the wars the US has gotten involved with in the last century have been a mistake. But I’m saying it: we need to get into it with North Korea. It may be too late, but we need to do it before it’s even more too late. Star Wars ain’t happening, so once North Korea is stocked with nuclear missiles they’re going to have the whole world by the short hairs. It’s going to be real ugly, but not quite as ugly as you may be thinking. First of all, there’s that million man army. They’ve never fought anyone, right? They’re draftees, forced to do everything they do by the government. They’re hungry and poorly equipped. Consider this: while the US armed forces have only about one and a half as many people as the North Koreans, their budget is almost 100 times as much: $6 billion vs. $533 billion. The one thing the Bush administration got right about Iraq was how easily their army surrendered, and exactly the same thing will happen in North Korea. I’m prepared to concede that it may be a violent war. We may not be able to take out all of their nuclear weapons in the first round of bombing, and they may get one off. A lot of people might die. But I don’t think any war in living memory has been as justified as this one would be. And consider what happens afterwards: unlike in Iraq, there is a perfectly obvious post-war strategy: Korean reunification. Not something the South Koreans are too keen to contemplate probably, but in the long run, and likely even in the medium run, it will turn out to be a good thing for everyone. Witness how smoothly German reunification went after some early hiccups. It’s hard to picture that the introduction of a huge and willing labor force into the South Korean economy wouldn’t spur a boom in manufacturing. And what China? Long North Korea’s biggest, if reluctant, ally, even China has been growing impatient with North Korea, as again the Wikileaks documents show. They want reunification! But more to the point, once war is inevitable China will realize what side their bread is buttered on, and they’ll have to go along. So that’s where we are at: a state that’s sufficiently totalitarian to keep internal dissent effectively nonexistent, is outwardly violent, and is building up its nuclear arsenal and dispersing it carelessly into the world for money. It pains me to arrive at this conclusion, but when our soldiers come home from Iraq and Afghanistan, they’re going to have a new job waiting for them. Posted on December 9, 2010 by Alesh Houdek. Posted in Politics7 Comments on What to do about North Korea? You might have missed it, but GM stock sale last week sealed the deal on a sea change in how our economy is going to work for huge companies going forward. When the bailouts of the financial industry were initiated, the outcry assumed that the taxpayers were “paying” to save the industry, and that the money was either mostly or totally gone. But in fact, many banks have repaid the money with interest, and while the government has not broken even on the deal, it is still possible that it will turn out to be profitable. We now see that the same may end up being true of GM, too: the sale of the government’s initial batch of GM stock went remarkably well — the company appears to have recovered, and if it continues to flourish it’s possible that the remaining stock will be sold at a sufficiently high price that we taxpayers will end up making money on the GM bailout, too. This should make us uncomfortable. And the not unreasonable presumption that the government’s interventions in the management of GM had a role in the success should make us even less comfortable. Because these pieces of good news set an irresistible precedent for how to deal with future calamities. Liberal and conservative economists so vary in their proposed remedies to problems that it’s it’s seldom possible to untangle economic facts their statements. But in the darkest days of the financial collapse, the one thing that all economists agreed on was that if you were going to bail out these huge companies, you had to make sure that no company was allowed to stay “too big to fail” going forward. Companies behave dangerously if they believe they have the safety net of a government bailout protecting them, but the safety net is unavoidable for huge companies. They’d have to be broken up into smaller companies, lest the whole process be repeated in the future. But when the financial reform bill came along in July, too big to fail provisions were conspicuously absent. Why? Well, the whole bill just barely squeaked by Republican opposition. Measures to limit the sizes of companies were practically laughed out of the legislation by Senate Republicans, who instead proposed new bankruptcy procedures for large failing institutions. Republicans are fundamentally responsible for the absence of too big to fail provisions in the current legislation. So consider these two facts: that the U.S. government now implicitly backs our largest corporations, and that when needed, government intervention may likely be good for both the taxpayer’s bottom line and for the companies involved. This, much more so than healthcare reform of anything else that has happened under the Obama administration so far, is classic Socialism. It’s richly ironic that Senate Republicans and the administration of George W. Bush, which began the whole process, are the ones fundamentally responsible.